The airport chaplain at Tampa International serves all faiths, all walks of life. 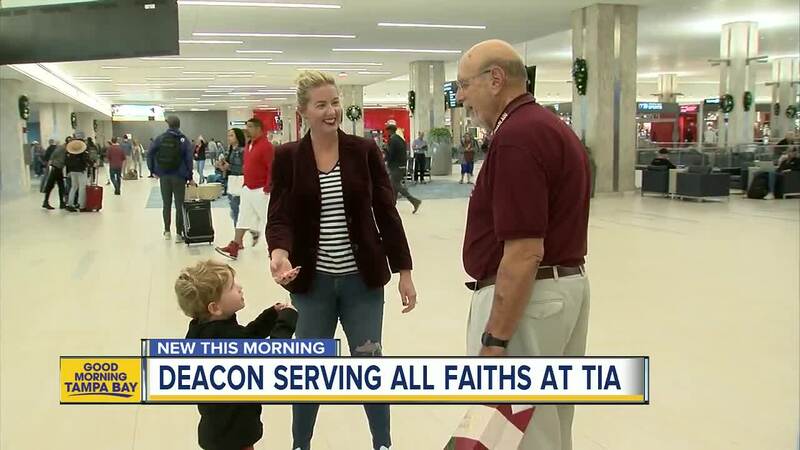 TAMPA, Fla. — They call him “Deacon Joe.” The airport chaplain at Tampa International, 78-year-old Joe Krzanowski serves all faiths, all walks of life. In the chapel near Gate F.
Much like the airport itself, this is his busiest time of year. Deacon Joe’s brother and his family were killed in the Air Florida crash into the Potomac River in Washington, D.C. in 1982. Back then there were no chaplains to talk to at the Tampa airport. Now Deacon Joe is here, walking five miles a visit, smiling at everyone while praying with anyone who needs it. “Sometime people just need to sit and talk a little bit,” Krzanowski says after leaving the USO Club where he prayed with a Marine.